Getting Things Done — Best PIM Software for You to Manage Data On The Go! Efficcess is a full-featured and cross-platform personal information manager. Just comply with its work line: Make Schedule -> Remind -> Do it -> Check -> Done, your life will be much easier than ever! 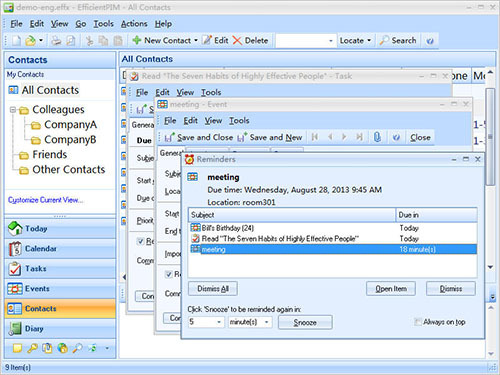 Besides, Efficcess could help you synchronize contacts, tasks, appointments and notes across computers and mobile phones. Efficcess is the right information manager for you to improve efficiency and get organized! With Efficcess (a PIM software program), you can manage contacts, appointments, tasks, diaries, notes, passwords, or any other information on both your PCs and mobile phones. According to some keywords, you can find your information just in one click. It is available for you to import, export or print information at any time. Efficcess coded by one of the greatest encryption algorithms in the world. Besides, you can set passwords to protect your info as well. What’s more, you can recover mistakenly deleted data from recycle bin. There is a MS-Word resembled document editor for you to write work diary, comments, notes or task details. “3 Stars” is perhaps a bit harsh, but it is based on limited Import options for the desktop version, plus the fact that the Android version is apparently still a work in progress. Efficcess, for individual use, closely resembles EssentialPIM Pro, which also experienced teething problems with its early Android version but which – at this time – seems a more robust application overall (& certainly on Android). If you are Most Interested in an Extensive Document Database – for Windows Desktop – take a look at RightNote (Pro). It is overkill for short notes / reminders, but excels in handling large chunks of data. And we still like eWallet for its unwavering ability to store a range of “sensitive” data & to accurately sync across multiple devices & platforms. Users who work with computers for most of their day are prone to forgetting important tasks and information. They can easily forget the tasks they need to carry out, or the important meetings and events that are coming up. This situation can only be improved by the use of a personal information manager, that can remind you of important tasks, events, and meetings. Efficcess is an efficient and reliable personal information manager, that is designed to make your life much easier. With this tool, you can now organize various information, such as tasks, events or contact details easily and can sync all the information across computers and mobile phones. The installer size is ~20MB only, and the installation process is very simple and quick. After launching it, you can straightaway start adding new tasks, events, calender entries, contacts, and notes. This tool also comes with password manages that can save your passwords and also your email accounts and software registration codes. Moreover, you can also adjust the looks of this application to your preference. The UI of this application allows for easy application to all the different options. All the organizing tools are present on the left-panel, and users can access tools like calendar, password manager, and notes etc. You can also change the way the UI looks, there are various colors and themes available and can be applied by one click from the drop-down menu easily. You can easily secure your personal information like notes, events, and tasks from others by setting up a password for accessing that information. You can easily password protect the dairy, notes, and password manager modules. This application can be set to automatically back up your information each time you close it. This ensures you do not lose any of the important information. There is an option to manually backup information to your desired location too. This tool works quickly and can perform tasks easily. Novice users can also get used to it easily, and set-up custom reminders, calendar entries, birthdays, tasks etc. With this tool, one can set-up recurring events too, that happens on daily, weekly, monthly or yearly basis and saves a lot of time as you do not need to waste time creating the same event again and again. 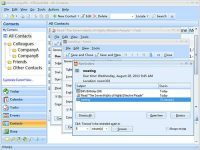 This tool allows users to save hundreds and thousands of contacts easily with information like contacts’ names, addresses, phone numbers, company information, email addresses and photos, as well as additional details and notes. This is very helpful for people with a lot of contacts. You can easily sync contacts, appointments, tasks, diaries, notes and passwords from your smartphone to your computer by using Efficcess app. The computer and application syncs easily without any problems at all. Efficcess is a handy software application that provides you with various organizer tools and helps you to manage your tasks and other information in a better way. The simple UI makes it possible for even novices to use it without any problems. It is a definitely recommended for users who forget important things while they are working on their computers.